At about 6:42 PM on Wednesday, April 10, 2019, members of the Youth Violence Strike Force assisted by the Bureau of Alcohol, Tobacco, Firearms and Explosives (ATF) made an on-site arrest and recovered a loaded firearm in the area of 12 Darlington Street in Dorchester. As part of an extensive ongoing, multi-agency investigation, officers arrested Justin Brown, 18-years-old, of Dorchester following a brief struggle in the area of the aforementioned location. Upon taking the suspect into custody, officers recovered a Ruger LCP .380 semi-automatic firearm loaded with five rounds of live ammunition from the suspect’s jacket pocket. Brown is expected to be arraigned in Dorchester District Court on charges of Unlawful Possession of a Firearm, Unlawful Possession of a Firearm with an Obliterated Serial Number, Unlawful Possession of Ammunition, and Carrying a Loaded Firearm on a Public Way. 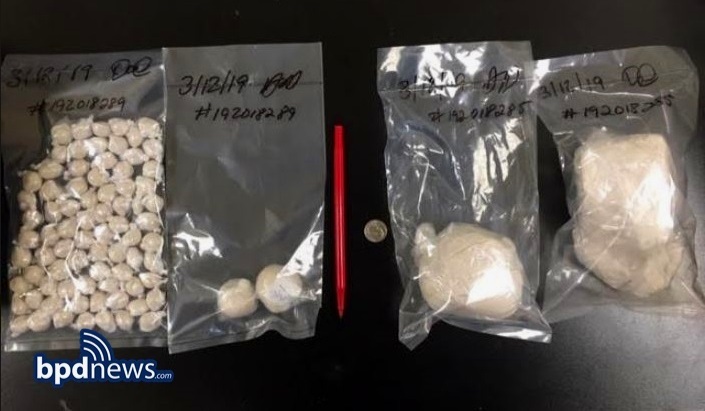 Keeping Boston Safe: At approximately 11:33 AM on Monday, April 8, 2019 members of the District C-6 (South Boston) and B-3 (Mattapan) Drug Control Units executed a search warrant of a residence in the area of 41 Evans Street in Dorchester. As a result, the following items were recovered: 9 MM Ruger semi-automatic firearm loaded with three rounds of live ammunition, over three -hundred and fifty rounds of live ammunition, multiple bags of a substance believed to be cocaine, approximately four ounces of marijuana, and an undisclosed amount of US Currency. Officers arrested Malcolm Hall, 29-years-old, of Dorchester and Alexander Leviner, 54-years-old, of Dorchester. Hall is charged with Unlawful Possession of Ammunition and Possession with Intent to Distribute Class B Drugs. Leviner is charged with Unlawful Possession of a Firearm, Unlawful Possession of a Firearm with an Obliterated Serial Number, Unlawful Possession of Ammunition, and Possession of Class A Drugs. Both are expected to be arraigned in Dorchester District Court. 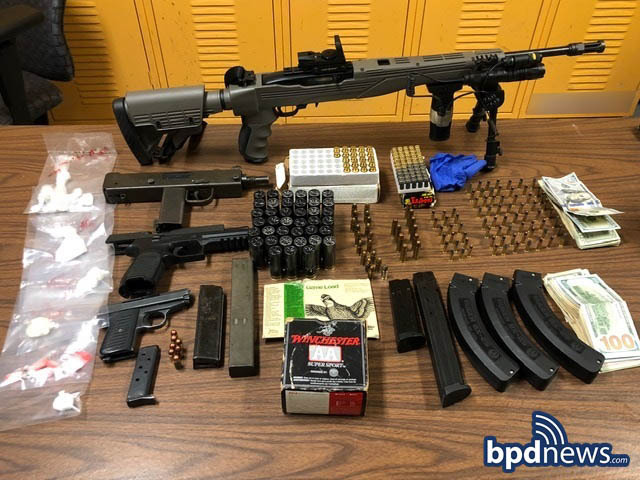 Keeping Boston Safe: At about 12:20 AM on Thursday, April 4, 2019, officers assigned to District B-3 (Mattapan) made an onsite arrest and recovered two illegal firearms, ammunition, drugs, and cash in the area of 9 Gallivan Boulevard in Dorchester. While on patrol in the area of the above location, officers observed a motor vehicle operating with excessive window tints. Officers conducted a traffic stop and while speaking with the operator, an inquiry of the operator’s license led to the discovery that it had been suspended. At this time, the operator was placed under arrest. A search of the vehicle led to the discovery of the following items: Smith & Wesson Bodyguard, semi-automatic .380 caliber firearm loaded with six rounds of live ammunition, Sig Sauer P938, semi-automatic, .380 caliber firearm loaded with five rounds of live ammunition, a Glock magazine loaded with thirteen rounds of live ammunition, approximately 254 grams of cocaine, approximately 121 grams of a crack cocaine, and an undisclosed amount of US Currency. Kaynan Yassim, 25-years-old, of Quincy was arrested and is expected to be arraigned in Dorchester District Court on charges including two counts of Unlawful Possession of a Firearm, two counts of Unlawful Possession of a Loaded Firearm, Unlawful Possession of Ammunition, Possession of a Large CPACITY Feeding Device, Trafficking Class B Substance, Possession with Intent to Distribute Class B Substance, and Operating with a Suspended License. Keeping Boston Safe: At about 6:15 PM on Friday, March 29, 2019, members of the District B-3 (Mattapan) Drug Control Unit executed a search warrant in the area of 5 Blue Hill Avenue in Roxbury. As a result of the search warrant, officers recovered the following items: a Springfield Armory 1911 .45 caliber firearm loaded with five rounds of live ammunition, ninety-two rounds of live ammunition, multiple plastic bags containing a substance believed to be marijuana, a stolen scooter, and an undisclosed amount of US Currency. The male suspect was taken into custody at the scene. Officers arrested Salomon Guerrero Jr., 28-years-old, of Roxbury. Guerrero Jr. is expected to be arraigned in Roxbury District Court on charges of Unlawful Possession of a Firearm, Unlawful Possession of Ammunition, Possession with Intent to Distribute Class D Substance, and Receiving Stolen Property. One Less Gun: At about 2:40 PM on Thursday, March 28, 2019, officers assigned to District B-3 (Mattapan) made an onsite arrest and recovered a loaded firearm in the area of 95 Milton Avenue in Dorchester. While on patrol in the area of the above location, officers observed a motor vehicle which had previously been involved in an incident at the New England Baptist Hospital in which the operator allegedly displayed and spoke about being in possession of a firearm. Assisted by members of the District B-3 (Mattapan) Drug Control Unit, officers conducted a traffic stop of the vehicle in the area of 95 Milton Avenue in Dorchester. The male operator was removed from the vehicle and officers subsequently observed the handle of a firearm partially covered by the floor mat in the front seat. Officers placed the operator under arrest and recovered a Polymer 80 Glock 23 firearm loaded with ten rounds of live ammunition from under the floor mat. An additional magazine loaded with ten rounds of live ammunition was located inside of a sweatshirt in the rear of the motor vehicle. Officers arrested Otiz Knights, 47-years-old, of Dorchester. Knights is expected to be arraigned in Dorchester District Court on charges of Unlawful Possession of a Firearm, Unlawful Possession of a Loaded Firearm, and Unlawful Possession of Ammunition. Keeping Boston Safe: At about 1:14 PM on Wednesday, March 20, 2019, detectives and officers assigned to District B-3 (Mattapan), assisted by the members of the SWAT Team executed a search warrant in the area of 11 Chamberlain Street in Dorchester as part of an active and ongoing investigation. As a result of the search warrant, officers recovered a black Glock semi-automatic firearm reported stolen out of North Carolina, a fully loaded high capacity extended feeding device, and multiple rounds of live ammunition. Officers arrested Keion Rowell Jr., 19-years-old, of Dorchester. Rowell Jr. is expected to be arraigned in Dorchester District Court on charges of Unlawful Possession of a Firearm, Unlawful Possession of Ammunition, Unlawful Possession of a High Capacity Feeding Device, and Assault by means of a Dangerous Weapon. Further Investigation revealed the suspect to have an active warrant out of Dedham District Court for charges of Leaving the Scene of an Accident with Property Damage, Marked Lanes Violation, Speeding, Negligent Operation of a Motor Vehicle, Operating a Motor Vehicle with a Suspended Registration, Failure to Stop for Police, and Uninsured Motor Vehicle. BPD Seeks the Public’s Help in Effort to Identify Person Responsible for Vandalism Done to Several Memorials at Mount Hope Cemetery in Mattapan: Earlier today, Tuesday, March 19, 2019, officers assigned to District B-3 (Mattapan) responded to the Mount Hope Cemetery in Mattapan where several memorial monuments, including one which is dedicated to fallen Boston Police officers, were reported vandalized. The Boston Police Relief Association Memorial (see photo) was erected in honor and memory of officers who have passed away. Detectives are in the early stages of the investigation which remains active and ongoing at this time. Additional vandalized memorials include the Civil War, Spanish American War, WWI & WWII monument altar, Knights of Columbus and Free Masons memorials. The Boston Police Department is actively investigating the facts and circumstances surrounding this incident. Anyone with information is strongly urged to contact District B-3 Detectives at (617) 343-4712. At about 9:35 PM on Monday March 18, 2019, officers assigned to District B-3 (Mattapan) arrested Verenisa Valdez, 25, of Jamaica Plain on firearm related charges during a traffic stop in the area of 226 Washington Street in Dorchester. The officers were on routine patrol when they stopped a motor vehicle with an expired registration which was being operated by the suspect at the time. Officers removed the suspect and placed her in custody without incident at which time they recovered a loaded .45 caliber Glock 38 handgun from inside the vehicle. The suspect will appear in Dorchester District Court on charges of Unlawful Possession of a Firearm (2nd & Subsequent), Unlawful Possession of Ammunition and Carrying a Loaded Firearm. At about 12:48 a.m. on Friday, March 15, 2019, officers assigned to District B-3 (Mattapan) responded to a radio call for an armed robbery in the area of 25 Sutton Street. The victim, a delivery driver, reported being robbed of an undisclosed amount of money at knifepoint. Officers investigated the number used to place the delivery request. Officers found the same phone number was used in 2 other armed robberies —of delivery drivers, in the same area. 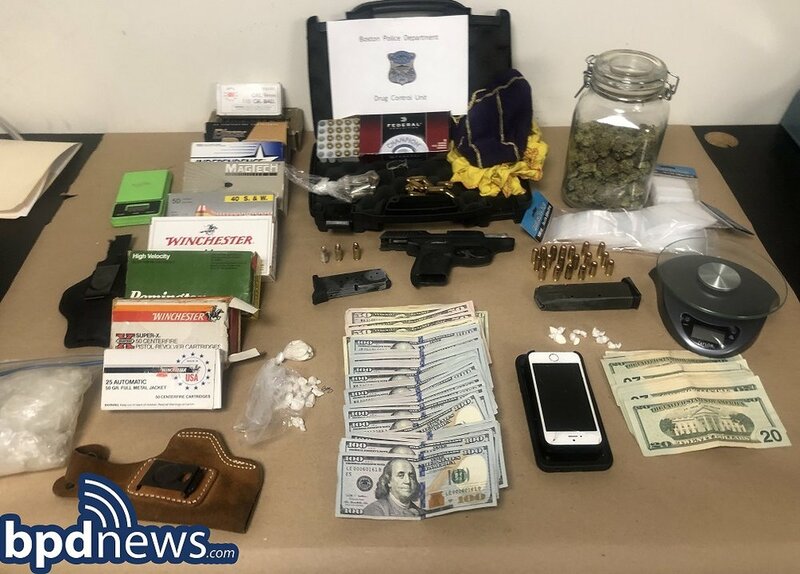 At about 6:10 a.m. on Friday, March 15, 2019 officers assigned to District B-3 (Mattapan) executed a search warrant in the area of 67 Wildwood Street. Jashone Bullock, 18 of Dorchester, was placed under arrest for Armed Robbery and Intent to Rob While Armed. He will be arraigned in Dorchester District Court. At about 7:24 PM on Wednesday March 13, 2019, officers assigned to District B-3 (Mattapan) arrested Hassaun Daily, 27, of Jamaica Plain on firearm related charges after responding to a call for a person with a gun in the area of Lorne Street and Wilbert Circle in Dorchester. During the incident, an adult male victim was approached by a motor vehicle being operated by the suspect. The suspect vehicle pulled along side the victim as he was walking down the street at which time the suspect made statements towards the victim while pointing a firearm at him. Officers searched the area and soon located the suspect motor vehicle parked nearby. When the officers asked the suspect to step out of the vehicle, he put the car in gear and attempted to flee. Additional responding units were able to block the suspect’s path of flight with their vehicles and convince the suspect to comply. Officers then removed the suspect and performed a pat frisk which led to the recovery of a loaded .380 Sig Sauer handgun equipped with a laser scope from inside the vehicle. The suspect was then placed in custody without incident. The suspect will appear in Dorchester District Court on charges of Unlawful Possession of a Firearm, Unlawful Possession of Ammunition and Failure to Submit to a Police Officer. ONE LESS GUN: At about 3:06 AM, on Wednesday, March 13, 2019, officers assigned to District B-3 (Mattapan) arrested two suspects and recovered a loaded firearm while investigating a stolen motor vehicle in the area of 40 Kingsdale Street in Dorchester. While traveling on Bernard Street, the officers checked the registration of a passing motor vehicle which revealed that both the vehicle and the license plates had been reported stolen. The suspect vehicle then turned onto Kingsdale Street and pulled into a parking space on the left side of the street. Officers approached the vehicle and removed the operator, Shamika Cespedes, 27, of Dorchester, after informing her that the car had been reported stolen. The suspect was placed in custody without incident. Officers then turned their attention to the front seat passenger, Jerry Gray, 22, of Dorchester, and removed him from the vehicle to perform a pat frisk at which time they recovered a loaded .380 caliber Ruger LCP II handgun with an obliterated serial number from the waistband area of his pants. The second suspect was then placed in custody without incident. Both suspects will face arraignment in Dorchester District Court. Jerry Gray will be charged with Unlawful Possession of a Firearm (3rd and Subsequent), Unlawful Possession of Ammunition, Carrying a Loaded Firearm and Possession of a Firearm with an Obliterated Serial Number. Shamika Cespedes will be charged with Receiving a Stolen Motor Vehicle. One Less Gun: At about 1:00 AM on Wednesday, February 27, 2019, officers assigned to District B-3 (Mattapan) made an onsite arrest and recovered a loaded firearm in the area of Babson Street and Mildred Avenue in Mattapan. While on patrol in the area of the above location, officers observed a motor vehicle traveling at an accelerated rate of speed in the area of Blue Hill Avenue and Almont Street in Mattapan. Officers initiated a traffic stop in the area of Babson Street and Mildred Avenue in Mattapan. While speaking to the occupants of the vehicle, the operator who appeared to be extremely nervous, stated multiple times, unprovoked, that officers could search the motor vehicle because they would not find anything inside. Officers then removed the occupants from the vehicle and subsequently located a substance believed to be crack cocaine on the operator’s person. The operator was taken into custody. Officers searched the motor vehicle before it was towed and located a Smith and Wesson Revolver loaded with six rounds of live ammunition. Officers arrested Sandy Baez, 23-years-old, of Randolph. Baez is expected to be arraigned in Dorchester District Court on charges of Unlawful Possession of a Firearm, Unlawful Possession of Ammunition, Possession with Intent to Distribute Class B Drugs, Possession of Class B Drugs, Racing a Motor Vehicle, Speeding, and Negligent Operation of a Motor Vehicle.